This is the first of many marvelous and wildly informative blog entries on teletherapy. It seems the future is already here with many of us providing therapy online. I want to share my two cents as a practitioner using the Internet to provide services. To be more precise, I was asked to write this. I’ve been hemming and hawing about it for weeks, since my writing skills aren’t as polished as my speech. I have a lot to say about telepractice and usually do just that—speak, rather than write. But we needed to expand our blog, so I agreed to do this. Since blogs are relaxed and casual, let’s agree to think of this as more of a fireside chat…with text. Not remotely presidential, yet still intimate and cozy. 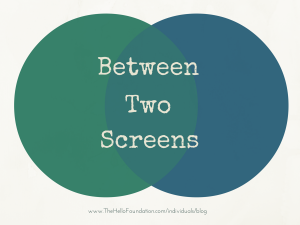 So, “Between Two Screens” it is. A bit about me. Picture the glow of my laptop screen as you gather closer. Professionally, I’m a generalist. I love that this field lets me dabble and learn ceaselessly. Kids? Great. Adults? Rad. Schools? Love ’em. Hospitals? Yes. SNFs, sure. At the moment, I work with children in schools through The Hello Foundation’s “Hello There” model. I also work with adults in SNFs and see clients of all ages online. Additionally, I am THF’s clinical coordinator for online services. Once in a while, I’ll even throw in a talk or podcast. Moving onward. Insert mental image of my brandy snifter being raised to my lips. Let’s talk tele. For the newbies: This means there is someone, somewhere, sitting in front of her computer, and me in front of mine. Some call it teletherapy. I like the sound of telepractice. It sounds…more professional, like it might include some pretty great stuff, perhaps even other services, such as OT or audiology. Either name is fine. The most important thing to realize is that it’s just a delivery method. The real meat is what we do best, which is providing great service regardless of the delivery method. Today, there’s a national spotlight on telemedicine. Plenty of healthcare organizations are working to solve the issues of waitlists and access to care. On a national scale, politicians and healthcare representatives are talking about using the Internet to meet the needs of rural populations or address ridiculously long wait lists. It only makes sense that we use the Internet during therapy as we use it in every other aspect of our lives. In the coming months, expect witty, insightful and unbelievably relevant posts as I blog about various telepractice topics, such as HIPAA compliance, large agency players (e.g., hospitals), private practice use, clients, technology, and beyond. If you’re using this model already or are just curious about it, please send me topics, comments, resources, or whatever else you think could help us all explore the value of telepractice. I’ll incorporate your information and views wherever I can. This post is part of our ongoing series, Between Two Screens, in which we share our take on the ever-changing and always-exciting world of speech language pathology and telepractice. Check out our other posts and let us know if there’s a topic you’d like us to cover!